Very pleasant stay. Attractive, spacious, comfortable and clean room. I especially enjoyed the Belgian waffle, boiled egg and fresh fruit salad for breakfast. Convenient to convention center (just a little over a mile) via trolley or by driving on Universal Building (you can avoid congested International Drive). Walk to nearby restaurants. The fresh fruit salad and warm hard boiled eggs; nutritious breakfast. Could hear voices and activity in next room. Not loud but apparent. The pet-friendly La Quinta Inn and Suites Orlando Convention Center comprises 184 rooms designed for families on vacation or the business traveler. Items included with the room rate at this seven-story hotel are a Bright Side breakfast, high-speed Internet access, local telephone calls and parking. The hotel is a 20-minute drive from Orlandos International Airport and within walking distance of the Orange County Convention Center. Other area landmarks and attractions include the theme parks at Walt Disney World, Sea World Adventure, the Wet 'n Wild water park, Universal Studios, the Islands of Adventure amusement park, the Florida Citrus Bowl, Amway Arena, home of the Orlando Magic basketball team and shopping at the Florida Mall, Prime Outlet Shopping Mall, Fashion Square Mall and the Florida Mall. All the rooms and 15 suites have a work area with high-speed Internet access, telephone with voicemail, television with cable news and movie channels, coffee maker, iron and ironing board, a radio and alarm clock and a hairdryer. The two-room suites and select rooms have a microwave oven and a refrigerator. This inn has an outdoor swimming pool and a fitness center. The complimentary breakfast is the only meal served. Restaurants nearby include Fish Bones, TGI Fridays, a Ponderosa Steakhouse, Chilis Bar and Grill and the Pirates Dinner Theater. 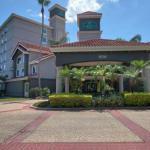 The 24-hour front desk has safe deposit boxes and information about the Orlando attractions and events. Other amenities include copy and fax services, a guest laundry and ice and vending machines. Frequent visitors to Orlando say this is one of the more expensive La Quinta Inns in the area but the few dollars extra are well worth it. Several travelers say they would not stay anywhere else in the area. Both the rooms and attractive grounds are well maintained. The cheerful crew of employees works hard to insure everyone has a good time and the complimentary breakfast makes a great start to the day. The location is good, close to the International Drive tourist strip, and most first time guests said they will here again the next time they come to town.